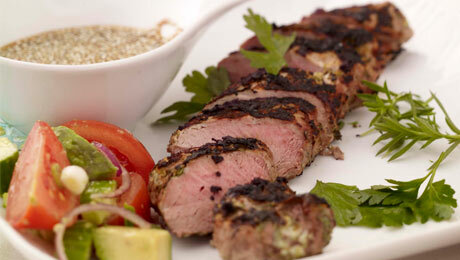 The combination of spice and herbs in this marinade is really great and livens up a boring pork steak for you! This marinade also works wonderfully on pork chops. Place the lime zest into a large mixing bowl with the ground cumin, garlic, coriander and natural yoghurt. Trim the pork steak of any excess fat or sinew and place in the marinade and allow to marinate for a couple of hours, although as with all mild flavoured marinades, overnight is preferable. Preheat the barbecue and cook the pork steak for 4-5 minutes on each side directly on the barbecue, then what I do is sit a small roasting tray on a slightly cooler part of the barbecue, pop the seared pork steak on that, close the lid on the barbecue and allow it to continue cooking for another 10 minutes. As barbecues tend to vary so much ensure it is fully cooked through before serving. Trim the pork steak of any excess fat or sinew and then cut into slices, approximately 1 inch each. Place the slices of pork between layers of cling film and use a rolling pin to flatten them slightly. Do not be too aggressive as you don't want to break the meat. Place the pork medallions in the yoghurt marinade. Cook for 3-4 minutes on each side on the barbecue. Serve the pork with some crusty bread. For the best cuts of Pork, or any other 100% Irish Meat, ask at the butcher counter and we'll be glad to give you just the right cut for your BBQ.